This post introduces a series of related talks on ‘the politics of evidence-based policymaking’ (EBPM) that I’m giving as part of larger series of talks during this ANZOG-funded/organised trip. The EBPM talks begin with a discussion of the same three points: what counts as evidence, why we must ignore most of it (and how), and the policy process in which policymakers use some of it. However, the framing of these points, and the ways in which we discuss the implications, varies markedly by audience. So, in this post, I provide a short discussion of the three points, then show how the audience matters (referring to the city as a shorthand for each talk). If you begin with (a) the question ‘why don’t policymakers use my evidence?’ I like to think you will end with (b) the question ‘why did I ever think they would?’. If you begin by taking the latter as (a) a criticism of politics and policymakers, I hope you will end by taking it as (b) a statement of the inevitability of the trade-offs that must accompany political choice. We may address these issues by improving the supply and use of evidence. However, it is more important to maintain the legitimacy of the politicians and political systems in which policymakers choose to ignore evidence. Technocracy is no substitute for democracy. Discussions of the use of evidence in policy often begin as a valence issue: who wouldn’t want to use good evidence when making policy? However, it only remains a valence issue when we refuse to define evidence and justify what counts as good evidence. After that, you soon see the political choices emerge. A reference to evidence is often a shorthand for scientific research evidence, and good often refers to specific research methods (such as randomised control trials). Or, you find people arguing very strongly in the almost-opposite direction, criticising this shorthand as exclusionary and questioning the ability of scientists to justify claims to superior knowledge. Somewhere in the middle, we find that a focus on evidence is a good way to think about the many forms of information or knowledge on which we might make decisions, including: a wider range of research methods and analyses, knowledge from experience, and data relating to the local context with which policy would interact. So, what begins as a valence issue becomes a gateway to many discussions about how to understand profound political choices regarding: how we make knowledge claims, how to ‘co-produce’ knowledge via dialogue among many groups, and the relationship between choices about evidence and governance. It is impossible to pay attention to all policy relevant evidence. There is far more information about the world than we are able to process. A focus on evidence gaps often gives way to the recognition that we need to find effective ways to ignore most evidence. There are many ways to describe how individuals combine cognition and emotion to limit their attention enough to make choices, and policy studies (to all intents and purposes) describe equivalent processes – described, for example, as ‘institutions’ or rules – in organisations and systems. One shortcut between information and choice is to set aims and priorities; to focus evidence gathering on a small number of problems or one way to define a problem, and identify the most reliable or trustworthy sources of evidence (often via evidence ‘synthesis’). Another is to make decisions quickly by relying on emotion, gut instinct, habit, and existing knowledge or familiarity with evidence. Either way, agenda setting and problem definition are political processes that address uncertainty and ambiguity. We gather evidence to reduce uncertainty, but first we must reduce ambiguity by exercising power to define the problem we seek to solve. It is impossible to control the policy process in which people use evidence. The model of a ‘policy cycle’ that sums up straightforward policymaking, through a series of stages, over which policymakers have clear control. At each stage, you know where evidence fits in: to help define the problem, generate solutions, and evaluate the results to set the agenda for the next cycle. A more complex ‘policy process’, or policymaking environment, of which policymakers have limited knowledge and even less control. In this environment, it is difficult to know with whom engage, the rules of engagement, or the likely impact of evidence. Overall, policy theories have much to offer people with an interest in evidence-use in policy, but primarily as a way to (a) manage expectations, to (b) produce more realistic strategies and less dispiriting conclusions. It is useful to frame our aim as to analyse the role of evidence within a policy process that (a) we don’t quite understand, rather than (b) we would like to exist. Below, you will find a short discussion of the variations of audience and topic. I’ll update and reflect on this discussion (in a revised version of this post) after taking part in the events. For Auckland and Wellington A, I’m aiming for an audience containing a high proportion of people with a background in social science and policy studies. I describe the discussion as ‘meta’ because I am talking about how I talk about EBPM to other audiences, then inviting discussion on key parts of that talk, such as how to conceptualise the policy process and present conceptual insights to people who have no intention of deep dives into policy theory. I often use the phrase ‘I’ve read it, so you don’t have to’ partly as a joke, but also to stress the importance of disciplinary synthesis when we engage in interdisciplinary (and inter-professional) discussion. If so, it is important to discuss how to produce such ‘synthetic’ accounts. I tend to describe key components of a policymaking environment quickly: many policy makers and influencers spread across many levels and types of government, institutions, networks, socioeconomic factors and events, and ideas. However, each of these terms represents a shorthand to describe a large and diverse literature. For example, I can describe an ‘institution’ in a few sentences, but the study of institutions contains a variety of approaches. Background post: I know my audience, but does my other audience know I know my audience? For Wellington B and Melbourne, the audience is an academic-practitioner mix. We discuss ways in which we can encourage the greater use of research evidence in policy, perhaps via closer collaboration between suppliers and users. Discussions with scientists: why do policymakers ignore my evidence? Sydney UNSW focuses more on researchers in scientific fields (often not in social science). I frame the question in a way that often seems central to scientific researcher interest: why do policymakers seem to ignore my evidence, and what can I do about it? Then, I tend to push back on the idea that the fault lies with politics and policymakers, to encourage researchers to think more about the policy process and how to engage effectively in it. If I’m trying to be annoying, I’ll suggest to a scientific audience that they see themselves as ‘rational’ and politicians as ‘irrational’. However, the more substantive discussion involves comparing (a) ‘how to make an impact’ advice drawn from the personal accounts of experienced individuals, giving advice to individuals, and (b) the sort of advice you might draw from policy theories which focus more on systems. Background post: What can you do when policymakers ignore your evidence? Canberra UNSW is more focused on early career researchers. I think this is the most difficult talk because I don’t rely on the same joke about my role: to turn up at the end of research projects to explain why they failed to have a non-academic impact. Instead, my aim is to encourage intelligent discussion about situating the ‘how to’ advice for individual researchers into a wider discussion of policymaking systems. Similarly, Brisbane A and B are about how to engage with practitioners, and communicate well to non-academic audiences, when most of your work and training is about something else entirely (such as learning about research methods and how to engage with the technical language of research). Note: I wrote the following discussion (last year) to be a Nature Comment but it was not to be! Nature articles on evidence-based policymaking often present what scientists would like to see: rules to minimise bias caused by the cognitive limits of policymakers, and a simple policy process in which we know how and when to present the best evidence. What if neither requirement is ever met? Scientists will despair of policymaking while their competitors engage pragmatically and more effectively. Scientists are drawn to the ‘policy cycle’, because it offers a simple – but misleading – model for engagement with policymaking. It identifies a core group of policymakers at the ‘centre’ of government, perhaps giving the impression that scientists should identify the correct ‘stages’ in which to engage (such as ‘agenda setting’ and ‘policy formulation’) to ensure the best use of evidence at the point of authoritative choice. This is certainly the image generated most frequently by health and environmental scientists when they seek insights from policy studies. Yet, this model does not describe reality. Many policymakers, in many levels and types of government, adopt and implement many measures at different times. For simplicity, we call the result ‘policy’ but almost no modern policy theory retains the linear policy cycle concept. In fact, it is more common to describe counterintuitive processes in which, for example, by the time policymaker attention rises to a policy problem at the ‘agenda setting’ stage, it is too late to formulate a solution. Instead, ‘policy entrepreneurs’ develop technically and politically feasible solutions then wait for attention to rise and for policymakers to have the motive and opportunity to act. Experienced government science advisors recognise this inability of the policy cycle image to describe real world policymaking. For example, Sir Peter Gluckman presents an amended version of this model, in which there are many interacting cycles in a kaleidoscope of activity, defying attempts to produce simple flow charts or decision trees. He describes the ‘art and craft’ of policy engagement, using simple heuristics to deal with a complex and ‘messy’ policy system. Policy studies help us identify two such heuristics or simple strategies. First, respond to policymaker psychology by adapting to the short cuts they use to gather enough information quickly: ‘rational’, via trusted sources of oral and written evidence, and ‘irrational’, via their beliefs, emotions, and habits. Policy theories describe many interest group or ‘advocacy coalition’ strategies, including a tendency to combine evidence with emotional appeals, romanticise their own cause and demonise their opponents, or tell simple emotional stories with a hero and moral to exploit the biases of their audience. 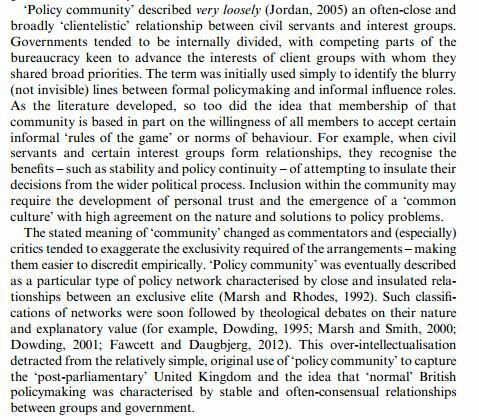 Second, adapt to complex ‘policy environments’ including: many policymakers at many levels and types of government, each with their own rules of evidence gathering, network formation, and ways of understanding policy problems and relevant socioeconomic conditions. For example, advocates of international treaties often find that the evidence-based arguments their international audience takes for granted become hotly contested at national or subnational levels (even if the national government is a signatory), while the same interest groups presenting the same evidence of a problem can be key insiders in one government department but ignored in another. Tobacco control represents a ‘best case’ example (box 1) from which we can draw key lessons for ecological and environmental policies, giving us a sense of perspective by highlighting the long term potential for major evidence-informed policy change. However, unlike their colleagues in public health, environmental scientists have not developed a clear sense of how to produce policy instruments that are technically and politically feasible, so the delivery of comparable policy change is not inevitable. Tobacco policy is a key example – and useful comparator for ecological and environmental policies – since it represents a best case scenario and cautionary tale. On the one hand, the scientific evidence on the links between smoking, mortality, and preventable death forms the basis for modern tobacco control policy. Leading countries – and the World Health Organisation, which oversees the Framework Convention on Tobacco Control (FCTC) – frame tobacco use as a public health ‘epidemic’ and allow their health departments to take the policy lead. Health departments foster networks with public health and medical groups at the expense of the tobacco industry, and emphasise the socioeconomic conditions – reductions in (a) smoking prevalence, (b) opposition to tobacco control, and (c) economic benefits to tobacco – most supportive of tobacco control. This framing, and conducive policymaking environment, helps give policymakers the motive and opportunity to choose policy instruments, such as bans on smoking in public places, which would otherwise seem politically infeasible. On the other hand, even in a small handful of leading countries such as the UK, it took twenty to thirty years to go from the supply of the evidence to a proportionate government response: from the early evidence on smoking in the 1950s prompting major changes from the 1980s, to the evidence on passive smoking in the 1980s prompting public bans from the 2000s onwards. In most countries, the production of a ‘comprehensive’ set of policy measures is not yet complete, even though most signed the FCTC. These insights help challenge the naïve position that, if policymaking can change to become less dysfunctional, scientists can be ‘honest brokers’ and expect policymakers to use their evidence quickly, routinely, and sincerely. Even in the best case scenario, evidence-informed change takes hard work, persistence, and decades to achieve. Since policymaking will always appear ‘irrational’ and complex’, scientists need to think harder about their role, then choose to engage more effectively or accept their lack of influence. To deal with ‘irrational’ policymakers, they should combine evidence with persuasion, simple stories, and emotional appeals, and frame their evidence to make the implications consistent with policymakers’ beliefs. To deal with complex environments, they should engage for the long term to work out how to form alliances with influencers who share their beliefs, understand in which ‘venues’ authoritative decisions are made and carried out, the rules of information processing in those venues, and the ‘currency’ used by policymakers when they describe policy problems and feasible solutions. In other words, develop skills that do not come with scientific training, avoid waiting for others to share your scientific mindset or respect for scientific evidence, and plan for the likely eventuality that policymaking will never become ‘evidence based’. This approach may be taken for granted in policy studies, but it raises uncomfortable dilemmas regarding how far scientists should go, to maximise the use of scientific evidence in policy, using persuasion and coalition-building. These dilemmas are too frequently overshadowed by claims – more comforting to scientists – that politicians are to blame because they do not understand how to generate, analyse, and use the best evidence. Scientists may only become effective in politics if they apply the same critical analysis to themselves. Sutherland, W.J. & Burgman, M. Nature 526, 317–318 (2015). Cairney, P. The Politics of Evidence-Based Policy Making (Palgrave Springer, 2016). Cairney, P. & Kwiatkowski, R. Palgrave Communications. Pielke Jr, R. originated the specific term The honest broker (Cambridge University Press, 2007) but this role is described more loosely by other commentators.